888 Bingo | Get £50 bonus when you join NOW! 888 Bingo is a top notch bingo site that comes from the online gaming giant 888.com. 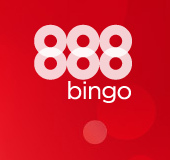 At 888bingo players can feel relaxed, as they play online bingo in a friendly, reputable and fun environment and even win the huge jackpots on offer! In February of 2015 888 Bingo unveiled a brand new look to their website with a fresh red and blue colour scheme. 888 Bingo has an impressive array of bingo promotions. Right when you sign up as a new member you'll be entitled to receive £50 bonus after making your first £10 deposit. You'll then be able to take advantage of the full promo suite. 888bingo allows players to experience vibrant chat and bubbly bingo chat hosts who are always at hand to make the overall bingo experience fun and exciting to players. Both 75-ball and 90-ball bingo games are on offer to players as well as special High 5 Bingo. There are tons coverall and progressive jackpot games available as well as exclusive featured games. Some of the top featured games include Starburst, Jack and the Beanstalk, Elements and Gonzo's Quest. The 888Ladies mobile app brings your favourite bingo gaming experience to your iPhone, iPad, Android phone or Tablet. You can play on 888Ladies mobile by searching for them from you device in your browser, scanning a QR code, in the App store or they can even text you teh details. Players receive a welcome bonus when they join and deposit a tenner. You can also make deposits and initiate withdrawals directly from the mobile app!